In the modern way of life there is lack of exercise for women contributing to damage their health. In the past women had enough exercises through grinding, washing, cleaning the house and the surroundings, lighting fire in the ovens etc. They used to live happily and contentedly through prayers, Bhajanas, Dhyana in the mornings and evenings, but nowadays facilities and comforts have increased and women have to adopt modern facilities to perform their occupational and household chores. Therefore Yogasanas are necessary in the modern, mechanical life to avoid the deficiency in health and exercises. Those who don’t have enough physical exercises should spare just ½ an hour to practice 15 to 20 Asanas systematically with proper breathing process. Every part of our body gets stimulated and becomes active and lighter by Yogasanas. One who practices Yogasana will be a woman of good character and a good citizen. 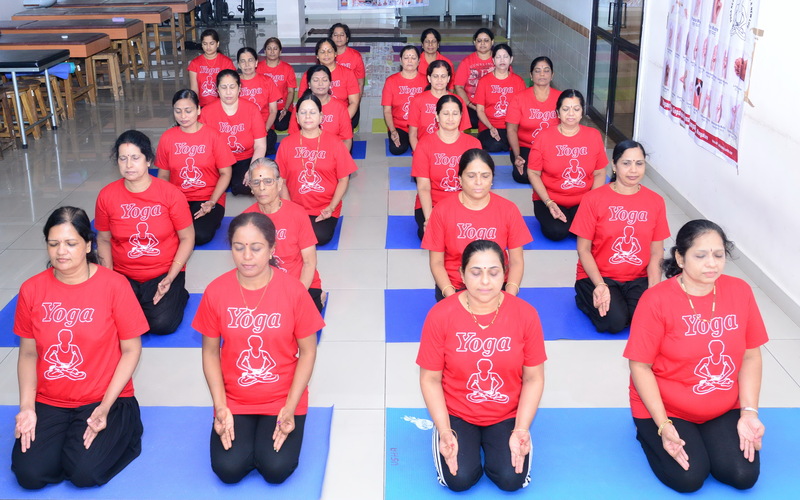 If Yogasana is done systematically with proper breathing system, blood circulation in the body becomes smoother, blood gets purified, and variations in blood pressure come under control and sugar content in the body will be normal. Most of the diseases can be cured without pain or expenses. Pain in the hips, back pain, pain in the knee joints, mental tension, and menses problem can be easily cured through the art of ancient Indian culture- Yogasanas. By doing Yogasanas the physical ability of women increases leading to all round development. A present day woman can practice these Yogasanas to protect health. Padmasana, Ardhachakrasana, Uttanasana, Trikonasana, Janushirshasana, Baddhakonasana, sarvangasana,Halasana, Makarasana, Bhujangasana, Vajrasana, Vakrasana, Veerasana, Shashankasana, Matyasana, Dhanurasana, Shavasana, simple Pranayama and Dhyana. If possible one can have hip bath in cold water systematically. An ancient art of Indian culture – “Yoga” has attracted the attention of the people al over the world. The world ‘Yoga’ is derived from the sankrit word “Yuj” – which means to concentrate one’s mind or to control one’s wish. There are 4 types of yoga called Jnana yoga, Bhakti Yoga, Karma Yoga and raja Yoga. In Patanjali Yoga Sutra, it is mentioned as ‘Chitta Vrithi Nirodhaha” which means checking the desires and fluctuations of mind and to achieve concentration is ‘Yoga’. Sage Patanjali has mentioned eight steps in Yoga. They are Yama, Niyama, Asana, pranayama, Pratyahara, Dharana, Dhyana, Samadhi. Asana means the posture of the body. These are firm and comfortable poses of the body. One should follow Yama and Niyama before practicing Yogasanas. Yama means improving moral standards and Niyama means safeguarding health through good physical and mental actions. Asanas keep the body healthy, strong light and in a balanced state. Yogasana is based on scientific study of the structure of human body (Anatomy). Throught Yogasana every part of the body becomes lighter and energetic making the body healthy. A yoga practitioner will be a person of character. But yoga should be learnt only through a teacher. Doing Yogasanas with the control of one’s breath, systematically will improve blood circulation in the body. It purifies blood. Immunity to diseases increases and one can cure diseases cheaply without pain. Pains like pain in the hips, back pain, pain in the legs can be easily cured.